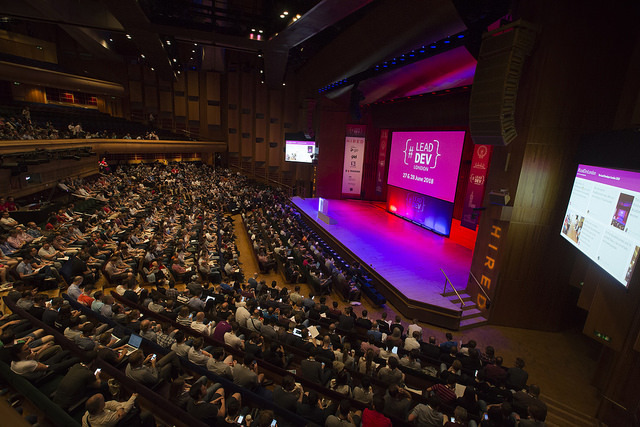 I attended the Lead Developer conference in London a couple of weeks ago. I enjoyed it and came back with lots of ideas buzzing around in my head. It’s a single track conference, which is good because you don’t have to make decisions about what to see and what to miss, but also you get to see some things you might not have chosen just based on the title. Many of the speakers have given longer versions of the talks elsewhere, or have written articles on the subject, so if particular topics are of interest it is possible to go and dig in further. You can think of it like a taster menu at a fancy restaurant. Alex has written up a longer form in this blog post while the video of her talk is on YouTube. This talk was about the psychology of code reviews and how to take that into account to get the best outcomes. People sometimes feel defensive about code reviews as it feels as if they are being criticized rather than the code under review. She talks about dividing up code review comments into 4 quadrants along 2 axes: High vs Low Conflict & High vs Low Reward. The Low Reward, High Conflict things tend to be preferences like where to put brackets and so on. The best way to handle these things is to agree code format standards and automate them away. The Low Conflict things don’t cause problems between team members because they are non-contentious. Things like obvious bugs (in the High Reward area) and debug statements (in the Low Reward area). It’s the High Reward, High Conflict things that are tricky. She suggests considering Conflict Resolution Archetypes- Avoiding vs Yielding vs Competing vs Collaborating. We are aiming for collaboration and she has some suggestions on how to achieve that. These include: Doing more pair programming and having more discussion before implementing a feature. Ensuring everyone reviews and is reviewed, so there is a level playing field. Using “we” rather than “you” or the passive voice to keep the whole tone of the review more neutral. Asking questions rather than making demands. Just being positive rather than negative or confrontational. As the receiver of the review, say thank you and also think about how you think someone else would respond. There is a longer version of this, in video form from the ACE conference while the short version from Lead Dev is on YouTube. Adrian works in the intersection between development, UX and product helping companies build the right things. This talk was about various dysfunctions he sees in the way people think about Scrum, Agile and requirements. The default scrum model that people use is kind of broken. Someone comes up with the vision that everyone is heading to. Someone comes up with the user journeys to get to that place, that gets split up into stories. Those stories are given to the developers and everyone lives happily ever after. But that’s a lie. Problems arise because the different stories are different sizes. So it’s hard to put them into fixed sprint-sized boxes or to get flow in a Kanban approach. So break them up into smaller ones and we get smoother flow. Give those to the developers and we’re done. Again that’s a lie. Bin – can we discard or postpone a story? Thin – can we deliver less and still get value? Split – can we break up a story and still get value from the pieces? Once that is done, give the stories to the development team and we are done. Once again, it’s a lie. The problem is that often the people who want to follow this approach don’t have the authority to make it happen. Adrian recommends User Story Mapping as a way to get good stories and keep the big picture in mind. He particularly likes the book that describes it, because if you give someone a book, it has much more weight than just, “hey try this technique”. The output is a map rather than a flat backlog. People tend to do this at the start, but it’s best to keep refining. Some of the ideas of this approach are described in Jeff Patton’s blog post that predates the book. The final talk I discussed from Day One of the conference was about the nuclear reactor meltdown at Three Mile Island. I recommend watching the video of this as he is a good story teller and I am not going to retell it in detail here. He first outlined the events that lead to the partial meltdown occurring and then discussed the ideas of the “first story” and “second story” as described by Sidney Dekker’s book “Field Guide to Understanding Human Error“. The “first story” is written with hindsight and outcome bias and generally seeks to blame someone for the results. The “second story” seeks to look at what happened through the eyes of those who were there and what they knew at the time. The idea is to start with the assumption that everyone was doing the best they could with the information they had at the time, so human error is never the cause of the event. This leads into the idea of blame-free post-mortems as a way to discover and fix systemic problems rather than seeking someone to blame. Uberto Barbini – Legacy Code – Big Rewrite or Progressive Rejuvenation? The first talk I discussed from the second day of the conference was this one about legacy systems. The video of this talk is on YouTube. A legacy system is old, but it works and usually makes money for the company, or it would have been retired. One of the options for dealing with such a system is to just keep patching it as changes are required. The downside to this is that the system slowly degrades as more and more changes are added. Another option is the big rewrite. This rarely works out. The thing you are replacing was successful, so not as simple to replace as you might think. The best approach seems to be the “Strangler” pattern as described by Martin Fowler whereby the new application wraps the old one and then slowly replaces it over time. This has the advantage of showing results quickly and not requiring a risky “big bang” switchover. Seal with external tests. First of all you need some high-level assurance that the system is working after you make changes. These tests may be discarded later, once there is better testing in place. Split into modules. Start improving the internal architecture to separate into logical pieces. Clean the module you need to work in, adding tests as you go. He had an interesting take on code quality – It’s not clean code, TDD, or patterns etc. Those are just tools to get code quality. The real test is if your application has been running for 10 years and you can still add features and fix bugs quickly, then you have high code quality. The final talk I discussed was about using agile techniques to improve the way teams are run. The video for this talk is also available on YouTube. In similar theme he talked about mentoring a lead. Again, working out where different responsibilities lie. Is the manager keeping it, Does the manager approve it, Does the new lead inform of their decisions, or Does the new lead take full responsibility? He also talked about improving team meetings. When it comes to making a decision he has two approaches: Polling – everyone gives their opinion, but in the end the manager decides. Voting – everyone votes. In the end the Manager has to accept and defend the decision. He talked about having a collaborative team meeting agenda in a shared Google Doc. For larger groups he recommends the Lean Coffee approach. Finally he talked about having more inclusive meetings. The lead needs to resist talking as other people will yield to them. He also suggested having an observer who points out interruptions, people not getting credit etc. This role should be rotated though to avoid people not contributing.